Emirates is by far the world’s largest operator of the A380. The airline has over 100 A380s in service, which represents nearly half of all A380s in service (that means they operate nearly as many A380s as the other dozen airlines with the plane combined). As a result, Emirates flies the A380 to some other airports that don’t otherwise get service from the world’s largest passenger jet. On top of that, they also operate an unbelievable number of A380 frequencies in some markets, like nine daily A380s between Dubai and London. Lately we’ve seen Emirates make quite a few capacity adjustments on US routes, and it looks like we now have a hint of what the next one may be. Emirates has flown to Boston for years, and at the moment they operate once daily Boeing 777-300ER flights between Dubai and Boston. Between November 2015 and April 2017, the airline operated two daily 777s between the cities, though they ended up cutting the second frequency following the laptop ban. Emirates wouldn’t be the first airline to operate an A380 to Boston. British Airways has been operating 3x weekly A380 flights between London Heathrow and Boston for a while. However, Emirates has the potential to be the only airline offering daily A380 service to the airport. So, why would Emirates need to test out the A380 at Boston Logan Airport, when another airline already flies the plane there? The airport has a few A380 gates, and British Airways exclusively uses one of them. Some suggest that the A380 gate that Emirates would use (E11, which is attached directly to their lounge) is quite tight, so some tests need to be run for pulling the plane into the gate and also pushing it back. It’s understandable that they’d want to test this out before committing to flying the A380 there permanently. With nine hours of ground time in Boston, they’ll have plenty of time to run all kinds of tests. At a minimum, this will be a great A380 spotting opportunity for those in Boston this Saturday. While it hasn’t been officially announced, I think it’s highly likely that Emirates will soon commence daily A380 flights to Boston. 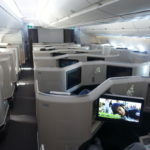 This would be great news for passengers, as the A380 is more comfortable than the 777 in all cabins, including first class and business class. 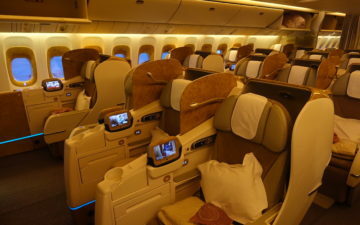 Do you think Emirates will end up adding A380 flights to Boston? The A380 doesn’t have much cargo room relative to the 777, since you have one cargo deck carrying two passenger decks’ worth of bags instead of one passenger deck’s worth, and apparently Emirates carries huge amounts of lobster as cargo departing from Boston. I don’t know if it’s enough to keep them from using an A380 on the route permanently, but it’s one factor in the equation. I really hope they add the A380 flights on a permanent basis. Would be nice to see the gates that Massport built exclusively for the A380, (it has 2 doors vertically, not horizontally so it can only be used for the A380) be used more, because now they feel slightly useless, considering Boston only gets seasonal 3x weekly service. From what I’ve heard the airline, doesn’t like that their plane will have to be towed to a remote stand for the 9 hours of ground time because in Terminal E (international terminal) all gates are common use, so Massport doesn’t like losing a widebody gate (especially during peak hours) for a plane to just sit there, but Emirates doesn’t want their plane to be towed. From what I understand they are going to tow it to a remote stand and test how the towing is. 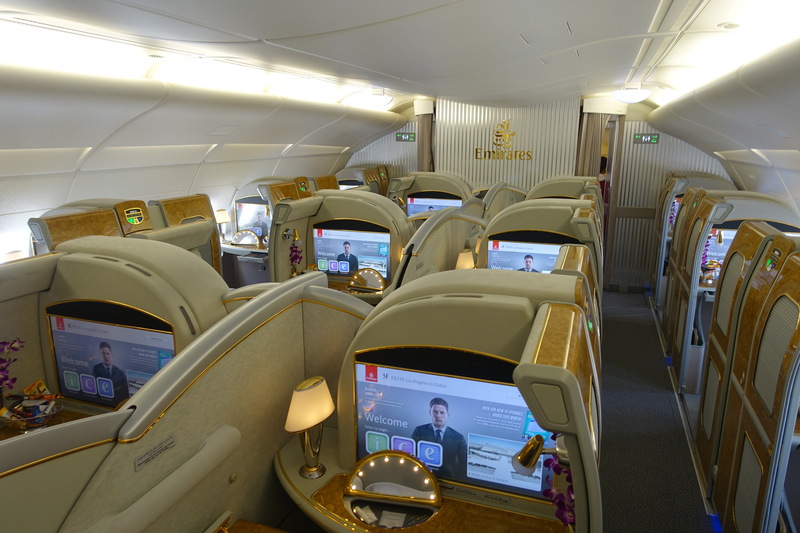 Do you know if Emirates plans to offer a BOS to MXP flight? @Bgriff: They will ask each passenger to bring on a box of lobsters and put them in the unused carry-on bins. Great to hear that about Boston, but it seems Emirates is adding A380 service to many places. They now have a daily A380 flight to Athens (YAAAAAYYY!) (NOT continuing to Newark though) and are going to send an A380 daily to Hamburg. I’m not sure if this has anything to due with their planes sitting on the ground due to lack of pilots. Thanks for explaining what the word “half” means!